location. 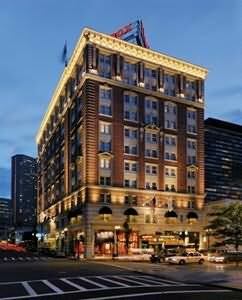 the lenox hotel in boston, mass., Is one block from copley square and newbury street. The hotel is within three blocks of trinity church and hynes convention center, and boston common and symphony hall are one half mile from the property. Fenway park is located one mile away. hotel features. constructed in 1900, the lenox's beaux arts building of dovetailed stone and brick was updated and meticulously restored in 2003. The hotel offers 24 hour front desk services and a multilingual staff. The business center includes complimentary high speed wired and wireless internet access. With d�cor inspired by the bluish hues of the ocean, the hotel's restaurant, azure, focuses on seafood. The hotel hosts two distinctly styled bars. The city bar offers a venue for evening cocktails, and s�l�s ("comfort" in gaelic) is a casual pub with irish food and atmosphere. guestrooms. the lenox hotel's 212 guestrooms feature overstuffed armchairs, dark wood desks and armoires. Corner suites include brass chandeliers and corner fireplaces. Bottled water is complimentary. Wireless internet access is also available. Refrigerators are available upon request. Bathrooms feature italian marble and are stocked with plush terry bathrobes and designer toiletries. expert tip. in the 1800s, the two mile stretch that is now newbury street was underwater as part of boston harbor. In 1857, the harbor was filled in to create the back bay area of the city. Today, newbury street rivals its counterparts in los angeles and new york as one of the most prestigious and eclectic shopping strips in the country, with eight blocks of cafes, boutiques and galleries ranging from high fashion to bohemian. What Makes this Hotel Green? This hotel has been labeled an Energy Star building for reaching a standard of energy efficiency in the year stated. The rating is verified by an outside professional engineer. This hotel is a voluntary member of the Green Hotels Association whose purpose is to bring together hotels interested in environmental issues. From adding "Drinking water served on request only" to the menu to installing new HVAC systems, Green Hotels Association encourages, promotes and supports the "greening" of the lodging industry.